Johnson, PTJ, KB Lunde, EM Thurman, EG Ritchie, SN Wray, DR Sutherland, JM Kapfer, TJ Frest, J Bowerman and AR Blaustein. 2002. Parasite (Ribeiroia ondatrae) infection linked to amphibian malformations in the western United States. Ecological Monographs 72:151-168. Building upon earlier laboratory experiments demonstrating that trematode parasites can induce deformities in developing frogs, this remarkable and ambitious field survey establishes conclusively that parasites are a major contributor to frog deformities in the American west. The research team, led by Pieter Johnson, found a strong geographic association between the abundance of Ribeiroia ondatrae, a trematode parasite, and the frequency of deformities in a series of amphibian species, including the western toad Bufo boreas, the Pacific treefrog Hyla regilla and the long-toed salamander Ambystoma macrodactylum. Their research also revealed no relationship between the concentrations of a large number of pesticides measured in pond water and the frequency of deformities. As noted below, these results do not absolve contamination of a role in amphibian deformities, but they certainly demonstrate the importance of parasites in the American west. What did they do? Johnson et al. surveyed amphibian deformities, parasite abundance, chemical characteristics and a host of other parameters (including presence of fish, cattle, snails, surrounding land use, wetland origen) in aquatic habitats in California, Oregon, Washington, Idaho and Montana. Their chemical measurements involved determining the concentrations of 52 different pesticides (and nine metabolites), plus pH, levels of nitrate and orthophosphate. At each site they collected 3-6 specimens of each amphibian present; these specimens were later dissected and examined for parasite infections. They then carried out a series of statistical analyses looking for associations between observed incidence of amphibian deformities and the many environmental parameters they measured. What did they find? Johnson et al. inspected 12,369 individuals representing 11 species of amphibians and reported deformities in 9 of the species examined. The frequency of abnormalities in sites varied from 0 to nearly 90% of animals examined. Deformities included a diversity of limb anomalies (including missing limbs and digits, extra limbs and digits) and, less frequently, missing eyes, jaw malformations and other abnormalities. 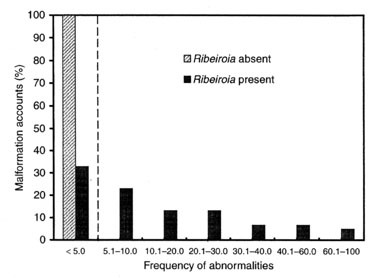 The frequency of amphibian malformations in relation to the presence or absence of Ribeiroia. In sites where Ribeiroia is absent, deformities were observed in fewer than 5% of animals surveyed. graph from Johnson et al. 2002. The frequency of deformities rose in relation to the frequency of parasite infections measured in amphibians dissected. Second, parasite abundance and amphibian deformities appeared to be associated with sites that were heavily affected by human disturbance, particularly cattle grazing, or were small impoundments such as constructed farm ponds. Johnson et al. found Ribeiroia in 59 sites in the 21 counties across 5 states where they sampled. The only significant predictors of parasite presence or abundance were the presence and abundance of snails in the genus Planorbella, a natural host of Ribeiroia. 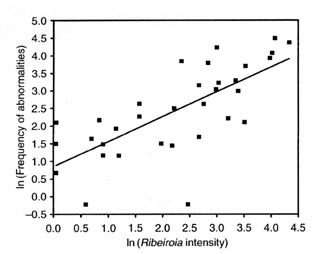 They could not establish the link between human disturbance and Ribeiroia abundance conclusively because, as they noted: "unimpacted sites were poorly represented in our survey and were usually at high elevations, precluding rigorous comparisons." "dramatic and widespread alterations of aquatic ecosystems, particularly the construction of small impoundments or farm ponds, may have created environments conducive to Ribeiroia infection. These modified habitats are frequently permanent or semi-permanent and highly productive, facilitating high densities of Planorbella snails. As natural wetlands continue to be lost, such aquatic systems may be becoming increasingly important to amphibians and waterfowl. Third, there was no association between deformities and the chemical parameters they measured in water samples. Of the 77 sites they sampled, only 3 had measurable levels of any pesticide compounds, despite their use of relatively sensitive assays (detection limits of 0.05 µg/L). This must be interpreted cautiously, however. First, measurements in the water column may reflect only poorly exposure sources in sediment and in biota. This is a common pattern for contaminants, especially lipophilic compounds. Second, while Johnson et al. sampled for a large number of pesticides and other chemicals, it is always possible that they missed the causative agent. Third, recent discoveries by Hayes et al. demonstrate severe impacts on developing frogs at levels of exposure similar to the detection limits of measurements in this study. What does it mean? In the American west, parasitic trematodes are an important, if not the principal, proximal cause of amphibian limb deformities. While the effects of contamination cannot be ruled out completely, it is apparent from this work that the geography of Ribeiroia distribution is the major determinant of when and where amphibian limb deformities are found in the American west. Johnson et al. point out appropriately that the fact that a natural parasite is inducing limb deformities does not mean, necessarily, that human influence is not involved in the recent surge of abnormalities. In particular, their finding that the abundance of Ribeiroia's host snails is linked to disturbance of aquatic habitats and artificial impoundments implicates human activities as a causal factor via two pathways. First, for some reason the snails thrive in these disturbed habitats, providing abundant hosts for the parasite and hence high parasite populations. Second, natural wetlands have been reduced, rendering the disturbed sites increasingly important for amphibian populations. Johnson et al. speculate about whether parasite-induced limb deformations may contribute to amphibian population declines. They conclude this remains a conjecture. Data from a previous study suggest that deformities increase mortality rates, but no information is available to ascertain whether this affects population levels. Questions also remain about why the deformity link to parasites is so clear in this study area yet remains more elusive in the mid-west and east, particularly southern Ontario. Finally, an important research question to pursue is whether contaminant impacts on amphibian immune systems make frogs more vulnerable to parasitic infections. Work in press indicates that very low levels of some pesticides reduce frog immune system competency by over 90%. Whether this reduces a frog's ability to reject foreign tissue--in this case the Ribeiroia infection--becomes an important question. Frog immune system impairment might also underlie vulnerability to fungal infection, which has been documented in the tropics as a major contributor to massive frog die-offs.